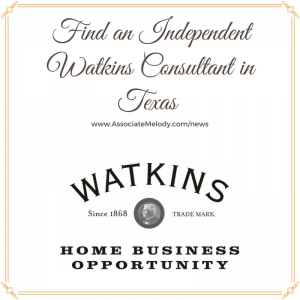 Looking for a Watkins Consultant in Texas? The following Independent Watkins Consultants will be happy to assist you. Best time to call: 9:00 am to 6:00 pm. If no answer, please leave a message. Best time to call: anytime. If no answer, please leave a message. Best time to call: 9:00 AM to 8:00 PM. If no answer, please leave a message. Serving Austin, TX and surrounding communities. Best time to call: 9:00 am to 9:00 pm. Texting is easiest way to reach me. Serving Gatesville, TX – Waco, TX – Belton, TX – Killeen, TX – Hewitt, Evant, TX – Hamilton, TX – Grandbury, TX – Jonesboro, TX and area. Best time to call: after 1pm Mon-Friday, and 8am-10 weekends. Serving Henderson, TX – Joinerville, TX – Laneville, TX – Minden, TX – Mount Enterprise, TX – Price, TX – Selman City, TX and area.